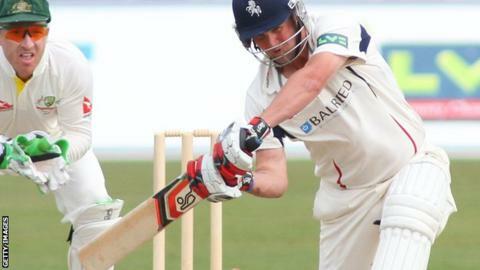 Kent and former England batsman Rob Key has confirmed his retirement after a first-class career spanning 17 years. The 36-year-old right-hander spent his entire career at Kent and captained the county in two spells. The opener played 15 Tests for England, including a double century against West Indies at Lord's in 2004, and scored 19,419 first-class runs. "The club and I have come to an agreement after a long and enjoyable career to call it a day," Key said. "It's time for the younger players to have their chance," he added. "It doesn't feel right for me to stand in their way any more. "It's been a great honour to represent Kent. I don't know what the future holds, but I look forward to what the next chapter has in store." Key made his first-class debut 1998 and hit a career-best 270 not out against Glamorgan in 2009. Capped by England at under-19 level, he helped his country win the under-19 World Cup in 1998 alongside players such as Graeme Swann and Owais Shah. He made his Test debut in 2002 against India at Trent Bridge and, after a spell out of the side, returned in 2004 to hit 221 in the first Test against West Indies as England completed a series whitewash. His two-term tenure as Kent captain was the longest at the county since Colin Cowdrey's 15-year spell from 1957 to 1971. "Rob has been an outstanding servant of Kent and England throughout his career," chairman George Kennedy said. "The current crop of exciting talent has learned much from his time at the helm. "A Kent side without Rob at the top of the order will look very odd and everyone wishes him all the best for the future."